At last you can easily get your Hotmail on your iPhone. 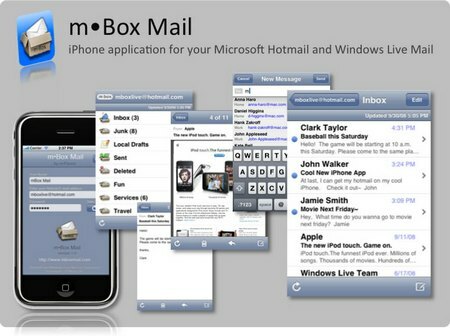 m•Box Mail is designed to help you get your Hotmail as you are used to getting your Hotmail. It is like the “native” or built-in mail application on the iPhone – only it speaks the Windows Live Hotmail protocol. Finally, you can have your Hotmail messages and folders on your iPhone screen ready to use at a moment’s notice. No more trying to log onto a Web site and struggling through your email. Instead you can access your Hotmail, organize it, delete it and send it – all from your iPhone, with the familiar iPhone user interface you’ve become so adept at using. iBlogger cannot connect if a blog’s web server redirects the URL more than once. It may crash or produce an error “site not found” during configuration. This issue will be fixed in iBlogger 1.0.7.
then use the latter URL to configure iBlogger 1.0.6.